The largest annual expense for a South Florida home owner is the total cost for hazard, windstorm and flood insurance. Insurance premiums have risen over the past 10 years, especially in states like Florida. Congress has enacted various legislation to help homeowners mitigate the true cost of insurance in storm prone areas, but those factors are only a temporary fix to the continued rise in homeowner insurance costs. U.S. hurricanes and tropical storms caused over $150 billion in losses from 1993 to 2012. Insurers in coastal states along the Atlantic seaboard and the Gulf of Mexico sell homeowners insurance policies with percentage deductibles for hurricane damage instead of the traditional dollar deductibles. These deductibles are separate from deductibles for other perils such as fire. 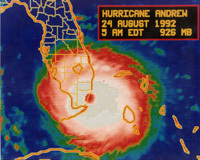 This radar image of Hurricane Andrew in 1992 still unnerves homeowners. Accidental discharge (flooding) from household appliance or plumbing. HO1 – Basic. Provides coverage on a home against 11 listed perils and personal liability. Contents are generally included in this type of coverage, but must be explicitly enumerated. This is not advisable, and generally will not be available in Florida. HO2 – Broad. Provides coverage on a home against all 16 listed perils, and usually includes a “named perils” policy, which lists the events that would be covered. HO3 – Special. The typical, most comprehensive form used for single-family homes in Florida. The policy provides “all risk” coverage on the home with some perils excluded, such as earthquake and flood. Contents are covered on a named peril basis. (“all risk” is essentially named exclusions (i.e., if it is not specifically excluded, it is covered). HO4 – Contents Broad. This is for renters. It covers personal property against the same 16 perils and usually includes liability coverage for personal injury or property damage inflicted on others. HO5 – Comprehensive. Covers the same as HO3 plus more. On this policy the contents are covered on an open peril basis, therefore as long as the cause of loss is not specifically excluded in the policy it will be covered for that cause of loss. HO6 – Unit-Owners. For condo and town home HOA owners, this policy insures your personal property, your walls, floors and ceiling against all of the 16 perils. HO8 – Modified Coverage is for the owner-occupied older home whose replacement cost far exceeds the property’s market value. If you let your own policy expire, your lender will buy this for you. It provides coverage against fire, smoke, windstorm, hail, lightning, explosion, vehicles, and civil unrest and does not cover your personal property, personal liability, or medical expenses. The most popular dwelling fire policy is the DP-3. The DP3 refers to an insurance policy on a residential building, usually rented to others. However, if the owner does not live at the property, a homeowners policy won’t work; use a “Dwelling Fire Policy” to protect your interests properly. Actual Cash Value – Cost to replace it, minus a deduction for depreciation. Replacement Cost – Cost to replace it, without deduction for depreciation. Extended Replacement Cost – Covers up to 100% of the value of the home, plus a certain percentage to cover rebuilding the home in today’s market. Coverage A covers the value of the dwelling itself (not including the land).Renter’s insurance has no Coverage A. Coverage B covers other structures around the property that are not used for business, except as a private garage. Sheds, awnings, gazebos, fences, screened enclosures are not covered as part of Coverage B. Additionally, carports are also not automatically covered, if their roof structure is different from the main dwelling. Coverage C covers personal property, with limits for the theft and loss of particular classes of items. Coverage D covers additional living expenses for loss of use in case your home is not inhabitable. Coverage E covers liability damages and legal expenses for which the insured is legally liable for. Exclusions to homeowner’s policies generally include floods, earth movement, water damage, power failure, neglect, war, nuclear hazard, septic tank back-up expenses, intentional loss, and concurrent causation. In addition, animal liability and mold remediation are not included. Hurricane deductibles and their triggers are set by law and are the same for the private, or regular market, as well as Florida’s Citizens Property Insurance Corporation (CPIC), the state-run program which provides property insurance to consumers. The hurricane deductible applies only once during a hurricane season. All insurers must offer a hurricane deductible of $500, 2 percent, 5 percent and 10 percent of the policy dwelling or structure limits. Florida law requires residential property insurance policies to include hurricane windstorm coverage in policies. “Hurricane coverage” is coverage for loss or damage caused by windstorm during a hurricane. It includes ensuing damage to the interior of a building, or to property inside a building, caused by rain, snow, sleet, hail, sand, or dust if the direct force of the windstorm first damages the building, causing an opening through which rain, snow, sleet, hail, sand, or dust enters and causes damage. ending 72 hours after the National Hurricane Center terminates the last hurricane watch or warning issued for any part of Florida. Flooding is defined by the National Flood Insurance Program as a general and temporary condition of partial or complete inundation of two or more acres of normally dry land area or two or more properties (at least one of which is your property) from: Overflow of inland waters, unusual and rapid accumulation or runoff of surface waters from any source, and mudflows. Eligible homeowners with mortgages on their homes are required by law to purchase a separate flood insurance policy. A number of factors are considered when determining your flood & windstorm insurance premium. These factors include: the amount and type of coverage being purchased, location and flood zone, and the design and age of your structure. For homes in high-risk areas (e.g., Special Flood Hazard Areas or AE, VE Zones) built after the first Flood Insurance Rate Maps were drawn for that community, the elevation of the building in relation to the base flood elevation is also required. So what can a homeowner do to reduce insurance premiums and what can potential buyers think about when buying property to avoid insurance shock? 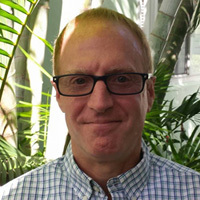 I recently met with Jay Roehrig of Karl Grace Insurance in Wilton Manors to discuss typical questions home buyers have about buying home, flood and windstorm insurance. Thanks for taking the time to meet me today, Jay. First, let me ask you how much coverage does a homeowner need in Florida? That depends on 4 elements: The value of your property and belongings, your security and self-protection, what your lender requires and finally certain policy requirements. First for coverage of your dwelling and personal property, the better your coverage the less you will have to pay out of pocket if you have to file a claim. You also need enough liability coverage to protect from lawsuits that could arise from accidents or negligence on your property. Your housing lender will require enough coverage for at least the amount of the mortgage or the replacement cost. Standard plans usually require policy limits of at least 80% of replacement cost. Preferred plans usually require policy limits at 100% of replacement cost. How can wind mitigation inspections save homeowners money? Insurance companies provide discounts on the hurricane windstorm portion of insurance premiums for residents who install wind resistant features on their homes. Available discounts range up to 42% of the hurricane windstorm portion of insurance premiums, and require a Wind Mitigation Inspection Inspection. The cost of the inspection often is offset by the accrued premium savings. Discounts are offered for things such as hurricane shutters, impact rated glass, roof-to-wall connections, roof deck fastening, building code equivalent roof covering, and hip roof shape. Inspectors will collect the following information during an inspection, The age of the home to determine what building code was in place at the time of construction, the age of the roof, documentation to prove if the roof was installed to any certain building code, the roof deck attachment, roof to wall connection, roof shape, existence of a SWR and the opening protection of the doors and windows. What parts of the home can affect the windstorm portion of the homeowner’s policy? Roof construction and age are still the number one factor. Any roof with less than 5 years of life will need to be replaced to obtain or maintain windstorm coverage. Door, windows, and garage doors also are a factor. So what if a home buyer find’s a house with a roof that is uninsurable, but still wants to buy the house? If they buy with cash, it’s not an issue, although you still want protection. Otherwise, buyers should request that the seller fix or replace the roof prior to closing. If that cannot be agreed on, then the buyer may be able to get an estimate, pay a deposit to a roofing contractor, and get the work completed after closing during an agreed upon time period with the insurer (usually 30 days). After the work is completed, the insurer will inspect the home and if insurable, issue the policy. Another option is an insurance policy can be written at the time of closing with a surplus line carrier/non-admitted carrier with a roof exclusion until replaced. A surplis line or non-admitted carrier is a carrier that does not pay into the Florida Guaranteed Fund, typically Lloyds of London. That type of policy must be paid in full. The insurance market is constantly changing. For more information on current policy requirements, limits and exclusions in home owner’s insurance, you may contact Jay at 954-546-6888. Read more about Typical Construction Features that reduce wind damage and loss.